A series of studies published today documents the vast conflicts of interest in medicine. The way we think about disease “is being subtly distorted” by financial ties, the authors of an editorial write. 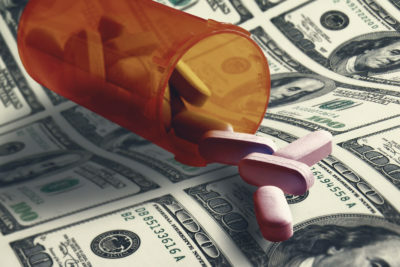 The long arm of the pharmaceutical industry continues to pervade practically every area of medicine, reaching those who write guidelines that shape doctors’ practices, patient advocacy organizations, letter writers to the Centers for Disease Control and Prevention, and even oncologists on Twitter, according to a series of papers on money and influence published today in JAMA Internal Medicine. “The very way we all think about disease — and the best ways to research, define, prevent, and treat it — is being subtly distorted because so many of the ostensibly independent players, including patient advocacy groups, are largely singing tunes acceptable to companies seeking to maximize markets for drugs and devices,” researchers Ray Moynihan and Lisa Bero wrote in an accompanying commentary. 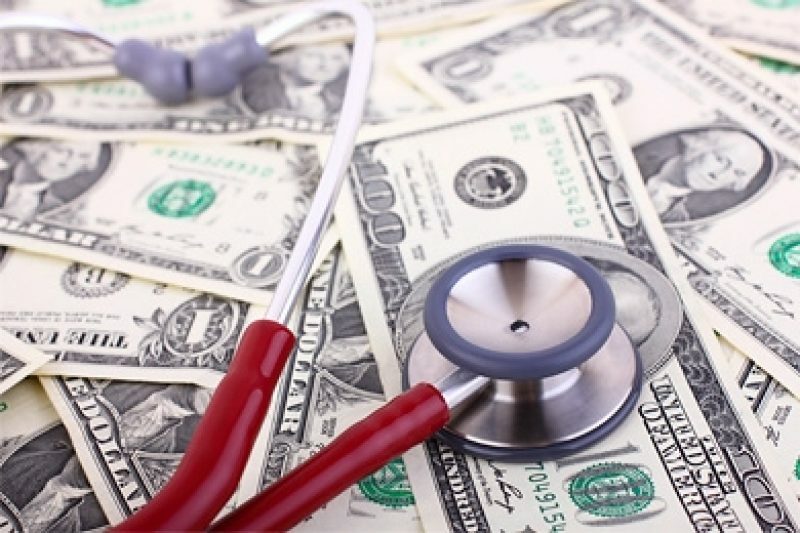 More than two-thirds of patient advocacy organizations that responded to a survey indicated that they had received industry funding in their last fiscal year. For most, the money represented a small share of their budget. But 12 percent said they received more than half of their money from industry. Most organizations reported having a conflict-of-interest policy, but a much smaller percent said that their groups had policies for public disclosure of those relationships. Fewer than 8 percent of respondents said their group “perceived pressure to conform its positions to the interests of corporate donors or partners” and nearly 14 percent said their group had declined a contribution because of concerns about conflicts of interest. “Although the amounts and proportions of financial support from industry are modest, the pervasive nature of industry support suggests the need for robust public debate about how to ensure that [these groups] serve the interests of their constituencies,” the authors affiliated with the Cleveland Clinic and other academic medical centers wrote. It called for greater transparency of funding sources by the groups. Find out how industry dollars reach your doctors. Explore the app. 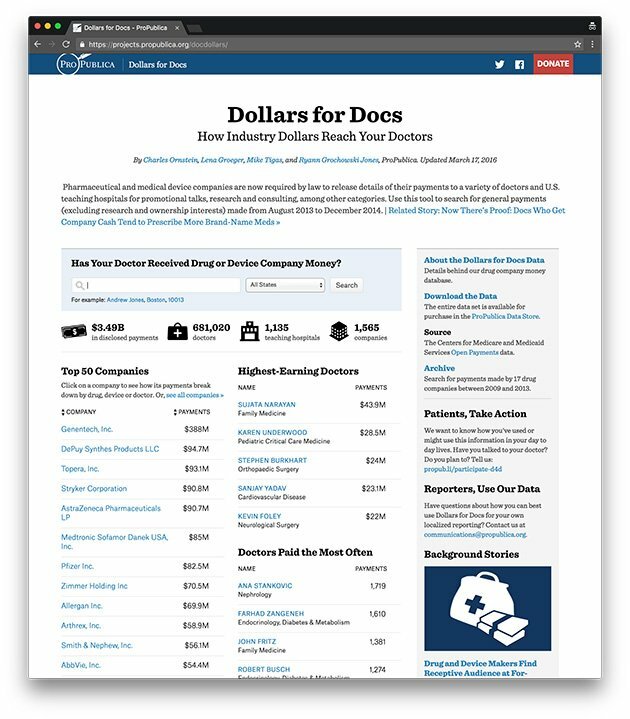 Download the data behind our Dollars for Docs reporting from the ProPublica Data Store. Organizations that received funding from opioid manufacturers were less supportive of guidelines proposed by the CDC to limit prescribing of the drugs for chronic pain. More than 150 organizations formally submitted comments after the proposed guidelines were released in February 2016, and 80 percent of them were supportive, though some had recommendations for changes. “More people are dying than ever before from these products and it’s important to know how the market is shaped by the spending of drug companies,” G. Caleb Alexander, co-director of the Center for Drug Safety and Effectiveness at Johns Hopkins University, said in an interview. Two committees that developed guidelines for the management of high cholesterol and hepatitis C did not fully comply with standards set by the Institute of Medicine in 2011 to limit the number of industry-funded panelists. The Institute of Medicine required that fewer than half of guideline writers have commercial ties and that all chairs and co-chairs have no conflicts. But in both cases, at least one chairperson received money from industry and, in the case of the hepatitis C guidelines, a substantial majority of panelists also received money. Moreover, the authors noted, when separate committees with no commercial conflicts developed guidelines for cholesterol and hepatitis C, the recommendations were more conservative and called for less expensive first line treatments. Nearly 80 percent of U.S. hematologist-oncologists who use Twitter have financial conflicts of interest. The authors said their results raise questions about how conflicts should be disclosed and managed on social media. It recommended that, at minimum, physicians active on Twitter should disclose their industry funding in their biographies. The pharmaceutical industry trade group, in a statement, defended the relationships between companies and other organizations. “Industry engages with stakeholders across the health-care system to hear their perspectives and priorities,” said the statement by Pharmaceutical Research and Manufacturers of America. “We work with many organizations with which we have disagreements on public policy issues, including on prescription medicine costs, but believe engagement and dialogue are critical. Moynihan and Bero, the authors of the JAMA Internal Medicine commentary, wrote that their primary concern is that patient groups actually speak for patients. Recently, when Mylan came under widespread criticism for the price of its EpiPen, patient groups were largely silent. “To ensure a healthier patient voice in medical research, education, policy and practice, sponsored groups that want to be seen as independent and credible need to decrease their industry sponsorship and ultimately disentangle, gaining in authority what they lose in resources,” they wrote.